From the Chats list, you can search for chats, people, and messages, including Actions, attachments, and texts. In the upper right corner of the Chats list, tap Search . Matches are grouped together under the All tab and separately under the Chats, People, and Messages tabs, respectively. You can also find actions by searching for their name, such as survey or poll. 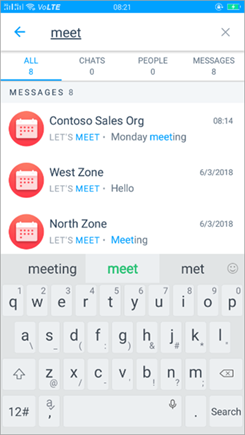 You can also use search within a chat for specific keywords. In the upper right corner of a chat, tap Search . A count of all matches found is listed with most recent message highlighted. Use the up and down arrows to move between the matches found.